All Owners ,tenants and identifiers(witneses) should have Adhaar and PAN number + Biometric device to scan fingerprint. Please enter the property details. Please take a note of generated e registration leave and license token number seen in the top right corner of the screen. 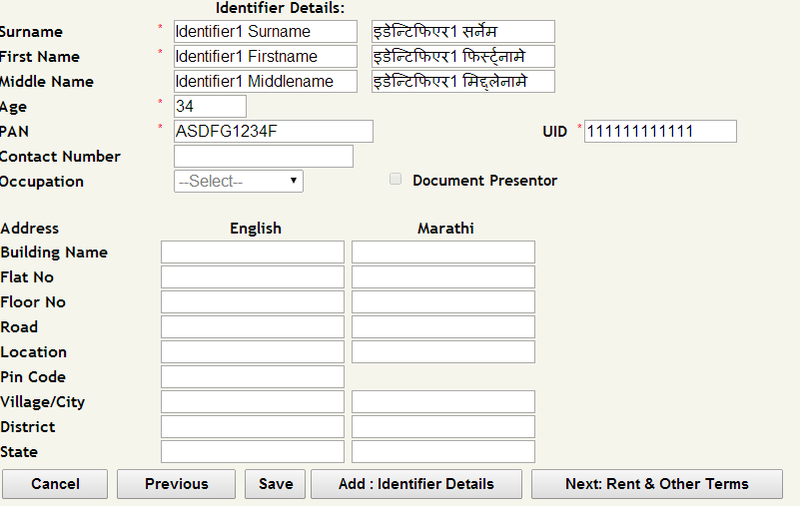 Now enter the Identifier details.There should two identifiers and both should have PAN and Adhaar number. What are the registration charges for online payment? Rent agreement is possible without owner presence ? What are your charges for the door step service? is aadhar card necessary for both parties? My owner has moved to Kochi, and I live in Pune. I just booked a vehicle and I need the registered agreement to get the licence number. Any way to make this happen? I like the transparency but it's only possible when owner directly gives his property on rent. what about broker and his brokerage ? it's big issue every year we have to pay them a big amount. You can contact us at 9595380945 to know our process..
As like Leave & License Agreement with notary is valuable. 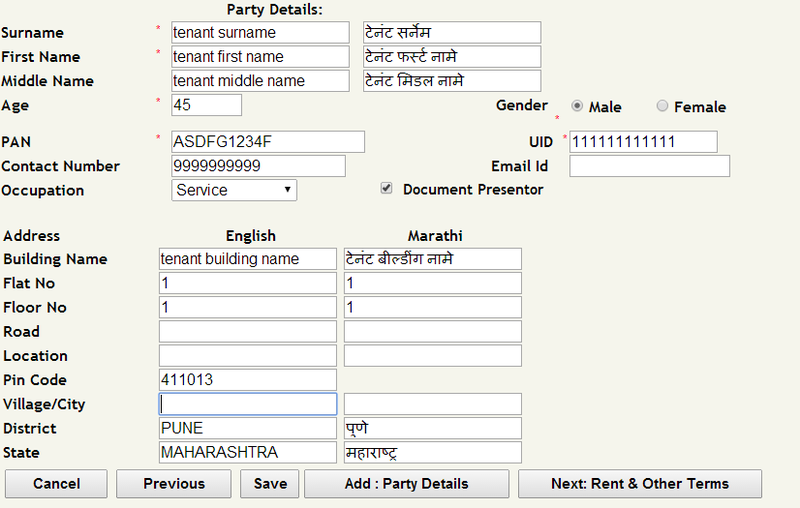 E registration by Maharashtra government is the online way of registering your leave and license document. I have already paid the registration charges through a bank, is it possible to still register online? Yes you can still register online. Is there an alternative process for verifying thumb impressions. 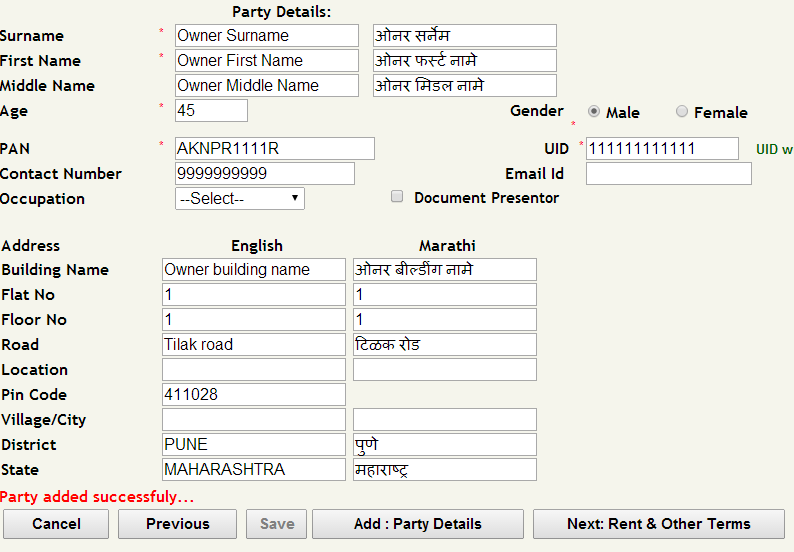 Due to age my landlord's fingerprints are not matching with that of adhar. I have already completed rest of the process including payment of registration and stamp fees. Its all stuck because of this,. Is it possible to sign the document manually now. There is no alternative in eRegistration as owner Adhhar is not matching. You can initiate new manual registration process and may be able to use stamp duty and registration fee paid for eRegistration. If you are Anulom customer, please write to anulomcontact@gmail.com with your document ID with Anulom for further correspondence. I am located in Chennai and have a property in Thane, Maharashtra. Is it possible to do e-registration without visiting Thane via Anulom (I do not have the biometric fingerprint device, my laptop does have a webcam). If yes please let me know the step by step process. Hi Kalyan, yes its possible to do the e-registration without you having to leave Chennai. Call our customer support on +91-959-538-0945, they will explain everything clearly. I am located in USA and I have property in Pune ,Maharashtra. Is it possible to do e-registration without visiting Pune via Anulom (I do not have the biometric fingerprint device but I can buy one here, my laptop does have a webcam). Maharashtra. Is it possible to do e-registration without visiting Thane via Anulom (I do not have the biometric fingerprint device, my laptop does have a webcam). I have given my property in Mumbai on leave and license agreement and have also registered the agreement with Registrar. However, I just came to know that details of licensor (address/details and phone number, AADHAR card, PAN card, photo ID proof), licensee (permanent address/details, office address/details and phone number, AADHAR card, PAN card, photo ID proof) and broker (address/details and phone number, AADHAR card, PAN card, photo ID proof) should be submitted to the local police as “Police Intimation”. There’s a document on Mumbai police website also. Now I am out of India. Mumbai police does not accept the form online. Can you help me file this document with Mumbai police? My landlord fingerprint is not matching due to faulty machine brought by anulom executive. Do we need to raise a new request and will it be chargeable?or will it be part of existing appointment? it is not our fault in any way. instead of a webcam, can we use the laptop camera to click photos? I had chat with your executive online and asked that owner and tenant in different cities , i.e Pune and Kolhapur and as per the communication he said both city they are covering and will able to proceed to leave and licence agreement . I again asked about any additional charges for Kolhapur city visit , he confirmed me that 1st visit they will do and any additional visit Anulom will charge 590 with GST . After getting confirmation I had made a payment on 25th Dec 18 and proceed for agreement and fixed appointment on 27th @ 3 pm for Bio-metrics.And same details of appointment mail gone to my Tenant . On 27th at 2.30 pm I got call from your team saying that they are not covering the Kolhapur city till now and call forwarded to Pune team and executive have to travel from Pune to Kolhapur and you will be charged Rs 3000/- extra . I got shocked to hear when I confirmed before going forward how can you asked me for additional payment and that too on the day when my tenant actually out of city for 15 days and has managed to be present for Bio-metric and half hour earlier I got call like this ?. From that time their was no any confirm concrete solution I got till now, Yesterday I again got call from your team from 7888001550 as per communication , I explain her every thing and she said its not 3000/- you will be charged 1500/- additional but again I confirm her before proceeding I had confirm with your executive on chat that their will be no additional charges for Kolhapur city visit then why you are asking then again she said I will check and confirm you, since then I had not received any call from your team and still my agreement is lying at that stage only.I am chatting with your executive continuously till this time but no concrete revert I had received , I really got frustrated and dont know what next to do. Since 25th already 4 days gone in this ………….but no resolution i received.